Falling under the category of “you can’t make this stuff up,” was the report of the recent theft of two Damien Hirst dot paintings from a gallery in the Notting Hill district of London. The two paintings were rather simply lifted right off the wall in plain view of a video camera and multiple street windows. What I can’t get over is why? Someone just needed to have some dots really, really badly, I guess. These dots weren’t that valuable compared to other recent art heists. Maybe we have been light of entertainment lately in the art world? The video of the theft is hilarious at the very least (see below). Even a six year old could have done this heist. Unfortunately, illusionist Derren Brown (story from The Drum) was forced to disavow any knowledge of the heist because of an ill timed Tweet. Judging by the video, it would be a major stretch to accuse this thief of being anything remotely resembling an illusionist. Had Brown been part of this theft, his vociferous denial would be from a need to save his reputation from accusations of imitating an illusionist than from the commission of a crime. Digging a little deeper into Hirst’s recent past, unearths a spat between the artist and a teenager over the lifting of a few pencils from a Hirst exhibit at the Tate. (The Independent has the story.) This spat also conjures up visions of six year olds. It seems the teen, who goes by the name Cartraine, had used an image of a Hirst artwork to make collages he then sold over the internet. That had set off a firestorm from Hirst leading to legal action against the teen. 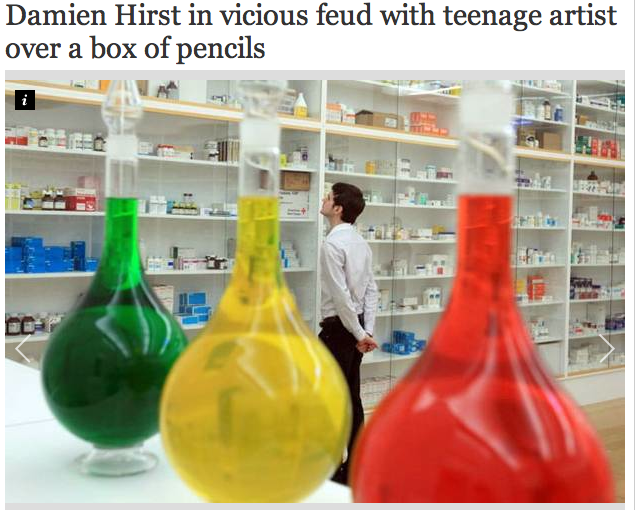 In retaliation, the teen stole a few pencils from a large Hirst installation (seen in the photo from The Independent) on exhibit at the Tate. So incensed was Hirst over the pencil theft, he had the teen and the teen’s father arrested and charged with theft of the pencils. Seems a bit like killing a mosquito with a sledgehammer, to me but it’s been a long time since I was six years old. Topping off the hilarity is the article on the heist for The Guardian by Jonathan Jones. To add insult to Hirst’s injury, Jones states, “Will history miss these pieces?’” My guess would be, “No!” Who’s going to miss a few dots? But its Jones’ final bit that deals the killing blow to this heist. 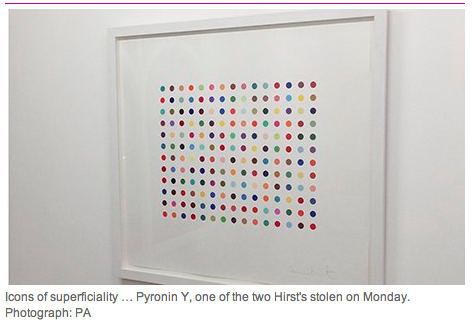 “Hirst’s spots are icons of superficiality for a superficial age. In that sense, they are contemporary classics. But I wouldn’t cross the road to nick one.” Neither would I. Or I doubt you would either, for that matter. Cue the clowns. It’s time to end this superficial farce. More from Sky news: here. This entry was posted in art, art museums, art news, Uncategorized and tagged Art, Damien Hirst art theft, Derren Brown, Guardian, Mark Twain, Notting Hill, The Independent. Bookmark the permalink. Wow. I agree with MT. I happen to think that Damien Hirst is the Emperor with No Clothes – pimped by Charles Saatchi – with these pathetic legal actions and dummy-spitting simply proving my point.